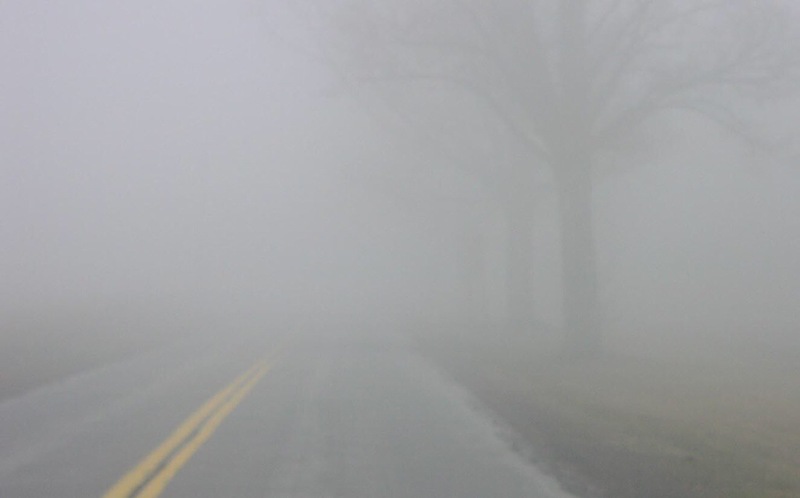 Have you ever had to drive in the fog? Some days I have to go through fog so thick it seems my headlights only light a few feet in front of my car. Even though I know where I am, it creates fear. What if there’s a wreck I can’t see? What if the road turns and I miss it? What if there’s something in the road? High beams, that help you to see far when it’s clear, only make the situation worse. You have to slow to a crawl just so you can feel safe in moving forward. You have to take your time in getting to your destination. You have to accept that you aren’t going to get where you are going when you planned on getting there. Faith is a lot like driving in a fog. It’s dangerous at times. It requires us to slow down and pay attention to everything. We don’t always see what’s right in front of us. It gets revealed to us little by little. God wants us to slow down and to make each move purposefully. He doesn’t want us to get in a hurry. That’s when accidents happen. We have to trust that we will get to where He wants us when His timing is right. That’s one of the hardest parts of being in a fog. We have our own ideas of when we want to get where He has us going and we try to get there as quickly as possible. I’m learning just how important the journey is. It’s not always about getting to the destination. The fog, the slow times and the detours are all part of God’s purpose for our lives. They build our faith and give us the seasoning that we need so that we are ready when we finally do arrive. I’ve seen how the slow times and the hard times in my life have prepared me for where I am today. I know that as time goes on, I’ll have a better perspective on the foggy times. It’s in those times that I didn’t rely on my headlights to see what was ahead. I used God’s lights to light each step of the path as I took them one by one. It’s easy to get frustrated when your vision is clouded by the fog of life. It’s hard to slow down and wait. I understand completely. I’m a person who likes to move. I like the sense of accomplishment I feel when I get to my intended destination. That’s what’s comfortable to me. Taking a detour and a route I’m unfamiliar with isn’t comfortable. Slowing down isn’t easy. Taking in the journey isn’t what’s natural for me, but it’s in those times that I trust God the most. It’s on the detours that I learn more about who God is and who He wants me to be. It’s when I slow down and take life one step at a time that my vision really becomes clear. I don’t have to worry about tomorrow or my destination. I’m called to be in this moment. Maybe you’re like me and you don’t like it when you can’t see very far ahead of you. We can learn a lot when life gets foggy. Don’t panic because you can’t see into the future. Don’t let fear of the unknown consume you. Our God knows your future better than we do. He sees through the fog and will guide us. Trust Him completely with each step. This uncertainty that comes from the unknown is meant to grow your faith and build your relationship with the Father. Don’t rush though it trying to get past it. Be in the moment and trust Him to use the foggy moments to get you where you’re going right on time. It’s often foggy when I drive to work in the mornings. It gets so thick I can hardly see very far in front of me. I know where I’m headed, but the exits and interchanges are difficult to see in the fog. I typically have to drive slower on days like that to make sure I don’t wreck or miss an exit. As the sun comes up, the fog begins to dissipate and my vision becomes clearer. I think it’s a lot like that for most of us when it comes to God’s plan and vision for our life. We might know where God has us going in this life, but we can’t see very far into the future. When we look down the road of our life, all we see is cloudiness and very few street signs. It’s hard to know which way to go, where to turn or when to brake. Others pass us as if the fog doesn’t exist. Are they being careless or is their vision somehow more clear than our own? There are choices we can make when dealing with the inability to see very far ahead in our lives. The first choice is to be frozen by fear of the unknown and to stay where we are. I’ve always heard people say, “If you aren’t moving forward, you’re moving backward.” The longer it takes me to move forward, the longer it will be until we get to where He wants us. What if Abraham had waited around when God said, “Go to the land that I will show you”? What would have happened if he had stayed where he was until God showed him where he wanted to go? God simply said, “Go.” God can correct our direction and movement, but only if we’re moving. He can’t change our course if we are sitting around. That brings us to our next choice. We can move in the fog and deal with the limited sight distance. I’ve noticed that when I move forward in a fog, I can see a little further than I could from where I was. Each step forward reveals things I had not seen before. I begin to see the signs I couldn’t see before. Moving forward in faith reveals more of God’s plan. The more time I spend with God, the more I allow His light to shine in my life. If I lift up the Son in all I do, I’ve found that my focus changes from the fog to pleasing Him. The fog is lifted because my faith has grown and my vision improves. I begin to see further down the road than I had. Jeremiah 29:11 tells us that God has plans for us. They are good plans and we need to trust Him one step at a time. He will reveal those plans for us as we move closer to Him and in the direction He is sending us.